David Oyelowo delivers an outstanding performance in this highly watchable biopic. So what is it about? Selma is a chronicle of Martin Luther King’s campaign to secure equal voting rights via an epic march from Selma to Montgomery, Alabama in 1965. I am a little ashamed to say that I knew nothing of the Selma March. I know who Martin Luther King is and what he stood for. BUT I didn’t really know the full extent of what the man accomplished. Other than deliver the “I Have a Dream” speech. Farewell, Danny from Spooks. I was afraid that David Oyelowo would never be able to shake off that iconic TV role for me. BUT in the last two years, I have seen him popping up in films more and more with his performances getting better and better; Jack Reacher, Interstellar, The Butler. I was waiting for him to get a meatier role to sink his teeth into and nothing could be bigger than the role of Dr King. He was fantastic. I went back to watch the infamous speeches of Dr King and Oyelowo captures his posture, his voice, the little pauses and tone perfectly. I am surprised that he didn’t at least receive a BAFTA nod for his performance. I mean if Laura Dern could get a Best Supporting Actress nod for Wild, then the man definitely deserved one. No disrespect, Miss Dern. The opening sequence surprised me in which we see Dr King receiving the Nobel Peace Prize in 1964. Another fact I did not know. This is soon followed by the unexpected (No, seriously. I jumped out of my seat) and harrowing 16th Street Baptist Church bombing. Director Ava DuVernay handled the material delicately. Four little girls killed through brutal ignorance. Subtle but tough viewing. To be honest, Selma was a little slow to get going. Considering the powerful opening, the drama seemed to be put on the back burner. The back room politics was interesting enough with King attempting to peacefully negotiate the black vote. BUT the constant flicking back and forth soon put me into a lull. Tom Wilkinson played LDJ brilliantly. The very definition of a politican. Promising to do his utmost but afraid to make any drastic changes as *cough* another election *cough* is on the cards. Giovanni Ribisi wasn’t bad. The only thing that was bad was his combover. The conspiring between LDJ and Edgar Hoover was unsettling. It will always remain suspect what happened to Malcolm X and Dr King. Allowing Dr King to continue to be the face of black rights until he began to challenge everything. While this is happening, we see the treatment of black voters in the southern states as they try and register. Oprah Winfrey was very good as Annie Lee Cooper. She wasn’t in it enough to be frank. Her treatment was unnecessary. Having to learn and recite the constitution. Fill in every detail of her form. Quizzed on how many members in a particular state and their names. Doing everything within their power to stop her getting the register to vote. King soon focuses his attention on Selma. A hot spot brewing with racial tension. The place where he will hold a peaceful march. The fact he was put under heavy surveillance by the government was shocking stuff. Branded as an agitator for failing to listen to reason and disrupting the peace. A joke. I thought King’s phone call with singer Mahalia Jackson was a little strange. Calling her in the middle of the night to hear a little gospel? BUT the stranger revelation out of the scene that it was logged in a surveillance report! I always thought Malcolm X and Dr King were not just fighting for the same thing BUT fighting the same way. I didn’t realise that King detested X’s violent methods and refused his help during the “peace” protests. Mr X even tried to rationalize with King. Trying to offer his militant ways as a distraction. To stop the wrong attention being focused on King’s cause. Tim Roth was very good as Governor George Wallace. He carried the accent well and brought a subtle menace to the role. Not enough of him to be honest. BUT of course the real battlefield was on the Edmund Pettus Bridge. Truly horrific stuff. The riots that ensued before and after the incident were bad enough but the attack on the Bridge was tough viewing. The sequence meshed in actual footage which really brought it home. Knowing that this actually happened. Shot for shot. However, in between these horrific moments, there wasn’t much else. It felt like they tried to piece more around the events of Selma. The dynamic with King and his wife wasn’t explored enough for me. The threatening phone calls and the constant fear of what would happen was certainly a catalyst. BUT there was a scene in which the government are desperate to destabilise his marriage by sending a recording of King with another woman. He doesn’t deny it very well. A mild insinuation that I wanted explaining. No one is perfect BUT was it mind games? Or did the government find something on the pastor? It was great to see Cuba Gooding Jr. and Martin Sheen in this BUT the roles they took on were so unmemorable and small that anyone could have played them. The sermons, although brilliantly executed by Oyelowo, were a little long at the tooth for me and didn’t hit home as much as I had wanted. Don’t get me wrong. Selma is still worth investing. There were some interesting developments that I didn’t know about. The constant mind changing of the Student Nonviolent Coordinating Committee (SNCC) who supported the cause when the odds looked good. Only to pull out when King and the protestors decided to take on the Bridge a second time. The closing credits around particular protestors had some shocking revelations that I did not anticipate. The march itself was tense to watch. BUT it just wasn’t quite as hard-hitting as it could have been. I understand that it is based on true events. BUT it felt like something was missing. The length was a little long for my liking. 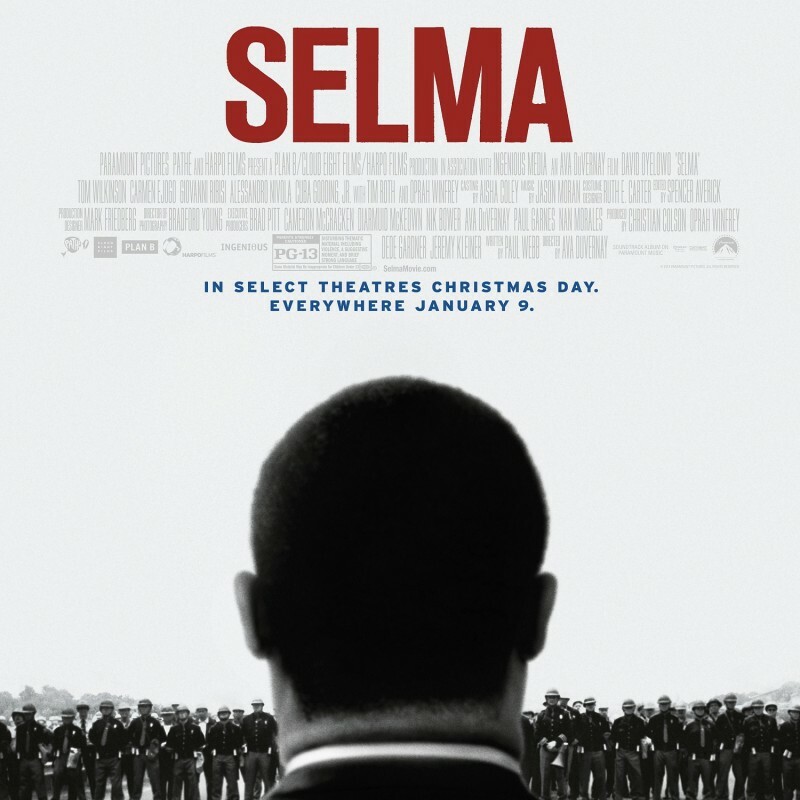 The politics and sermons seem to kill the tension and pace that was spurning Selma on for me. However, that doesn’t stop a sterling performance and interesting if (in parts) brutal re-telling of a crucial moment in history.